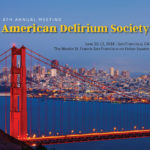 The American Delirium Society (ADS) annual conference was held in June 2018 to share the latest advancements in delirium science. 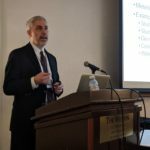 A wide variety of topics from delirium training assessments to the latest scientific advancements were covered. 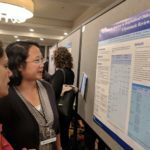 NIDUS (Network for Investigation of Delirium: Unifying Scientists) partnered with ADS to disseminate findings, update scientists and clinicians attending, and judge accepted posters. There were many fascinating presentations at ADS, and a few highlights are shared below in no particular order. Drs. Tamara Fong and Ariba Khan discuss a poster at ADS 2018. The ADS conference had many amazing presentations. The session “Statistical Methods for Delirium Research: Existing and Novel Statistical Methods that can Improve your Research” explored advanced methods for delirium analysis. The latest updates on delirium in the clinical and research setting were interwoven throughout the conference and I particularly enjoyed the sessions “Delirium Detection and Management” and “Epidemiology/Biomarkers” to name just a few! Drs. John Devlin and Karin Neufeld gave a thought-provoking and thorough Pro/Con Debate on “The Use of Antipsychotic Agents in Delirium Management”. Innovative methods to create change and generate solutions were given by Dr. Malaz Boustani and Nadia Adams in the “Implementation Science Skills” and “Innovation Forum” workshops. The importance of social media was highlighted by the session “Using Social Media to Increase Delirium Awareness and Recognition” and it even included an ADS conference Twitterchat. For many, this was an initial exploration into how a Twitterchat works and a highly encourage you to participate in future #Delirium Twitterchats! At the session “Overview of the Latest Network for Investigation of Delirium: Unifying Scientists (NIDUS) Activities and Resources”, Dr. Sharon Inouye moderated as NIDUS Core and Task Force leaders reported significant progress in each focus area and a wealth of information and resources is being built for delirium-focused scientists. The first wave of entries to the Research Resources Database has been completed. This catalog includes ongoing and completed studies that include delirium as a predictor or outcome variable. In July, a research browser that will help you find a delirium collaborator or search for studies containing particular data will be launched. For example, you will be able to determine which studies have investigated a particular biomarker through this database or who you might contact to learn more about a particular study design. Very exciting! All researchers are encouraged to enter their study data to ensure this new tool is a comprehensive resource. “Symptom Coverage Table” compares 17 delirium severity measures, including diagnostic, neuropsychiatric symptoms, clinical and episode. This is a great resource if you are considering the use of a delirium severity measure in your study, but are unsure which one would adequately capture the symptoms you are interested in. “Delirium Severity Measures Summary Table” includes time to completion and number of items on each severity measurement. Information cards for 23 delirium measurement tools are now available as standardized, 1-page forms summarizing important information about each tool including references. More information on these Cores as well as Pilot Awards, Mentoring and Career Development resources and the most recent updates on delirium are available at www.deliriumnetwork.org. The NIDUS Scientific Session at the ADS conference included timely presentations from top delirium researchers including Dr. Sharon Inouye, Dr. Tamara Fong, Dr. Sarinnapha Vasunilashorn, Dr. Dae Hyun Kim, Dr. Jo Wilson, and Dr. Matthew Duprey. Exciting advancements include the development of a delirium burden instrument, investigation of a multi-protein signature for postoperative delirium, further understanding of delirium risk in relation to increasing age, and catatonia in critical care patients. And these were only a few of the many interesting presentations at ADS!! This was my third year attending the ADS conference, and each year I improve as a clinician and scientist because of the outstanding educational and scientific presentations. I encourage you to attend the 2019 ADS conference on June 16-19 in Boston. Until then, there are several other opportunities to expand your delirium knowledge including the Australasian Delirium Association conference on September 5-7, 2018 in Melbourne (https://www.delirium.org.au/2018-Conference) and the European Delirium Association annual meeting in The Netherlands on November 1-2, 2018 (http://www.europeandeliriumassociation.com). Make sure to watch the NIDUS calendar of events for updates, https://deliriumnetwork.org/calendar/ and remember that NIDUS pilot grant applications are due by Wednesday, November 7th! Posted in NIDUS Blog and tagged ADS 2018, Delirium, delirium research, NIDUS.